I considered doing a straightforward synopsis and response for Sansho the Bailiff, but I found it insufficient in illustrating how emotionally draining the film can be. A synopsis may cover the events of the film but it serves to downplay the human drama at its center, which offers a bittersweet commentary on humans and their lack of humanity. Perhaps what is most impressive about Sansho the Bailiff is that its philosophy and criticisms on humanity are applicable today. Certainly in a world where slavery and class divisions persist, Sansho the Bailiff magnifies social injustices and its affects on people, therein offering identifiable features to something that may seem foreign – especially to those in privileged positions. Mizoguchi is subtle in his direction, wherein there are no dynamic camera movements or sweeping transitions. Effectively, this places the viewer in a position to absorb events for its maximum emotional power. Mizoguchi allows his actors and the narrative to draw the audience in, as the shock of inhumanity on display provokes such a strong emotional reaction. 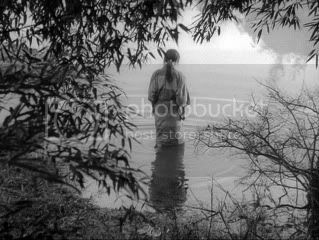 There is a humanistic message to be derived from Sansho the Bailiff, particularly as the film reaches its conclusion - though in a way, whatever reassurance and insight on humanity that Mizoguchi offers is a bit too late. The film is an emotional journey that hypnotizes, though it functions as an endurance test as to how much human suffering a viewer could withstand.